The Fujifilm X100S camera has replaced the Nikon P7000 as the camera of choice for our EDC gear. We now hardly go anywhere without it. To keep it protected while on the go, we ordered a custom, hand-built JnK leather case for it. The JnK sleeve was beautifully crafted and does an excellent job of shielding the camera from the everyday bumps and knocks. However, based on requests from our readers, we will look at a few more accessories that are also good to pair with the Fujifilm X100S. Mention “camera accessories” and most people’s first thought is “camera bags.” However, we think that first thought should be “second battery.” For items such as batteries, there is little reason to go OEM. After a little looking around, we found a better aftermarket option from Blue Nook. Their Wasabi Power NP-95 replacement battery is half the price of the Fuji unit. Rated at 2200mAh vs Fuji’s 1800mAh, the Wasabi battery should also run longer before it needs to be recharged. No downside about it from where we stand. 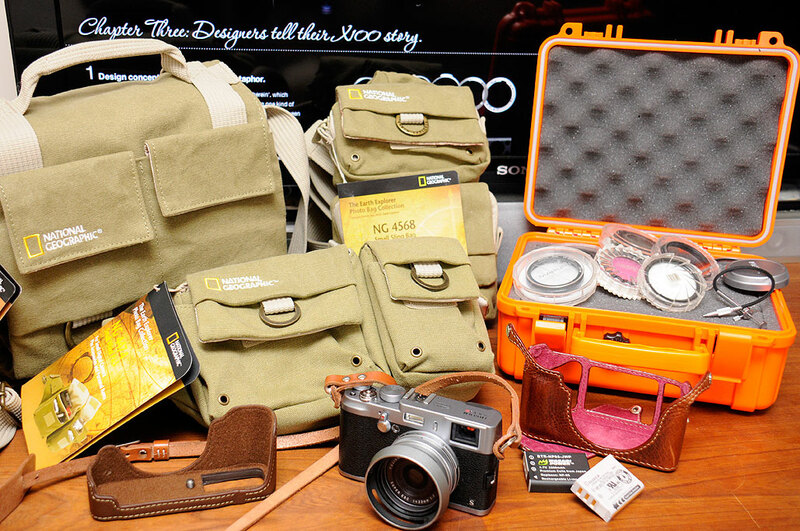 The stylish X100S deserves a bag which will both protect the camera and look great doing it. National Geographic’s cloth bags are such bags. 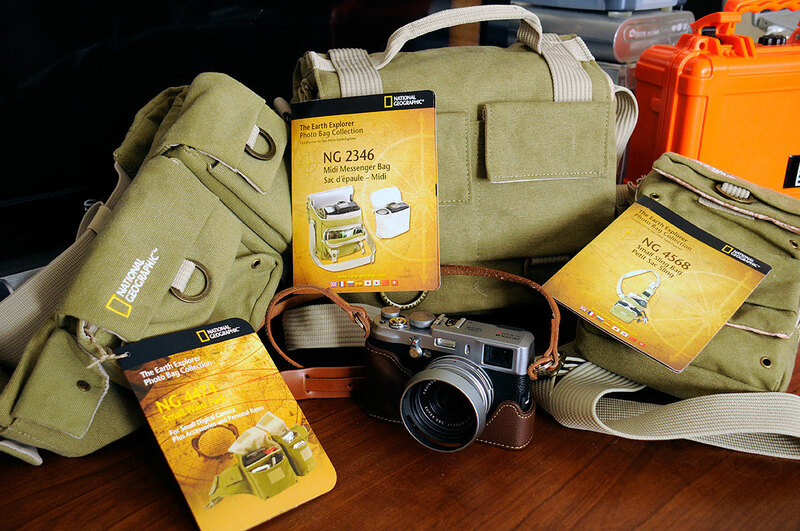 The folks at National Geographic have been partnering with Manfrotto to create a series of innovative and distinctive photography bags which reflect the spirit of adventure associated with the Society. After having had a first-hand look, we think they have done an excellent job. We mentioned their Earth Explorer series in the 2011 Holiday Gift Guide. They have tweaked the designs and refreshed the line for 2013. The line is pretty large, but there are three bags which pair well with the X100S (NG 2346, NG 4474, NG 4568). The EARTH EXPLORER bags are a blend of modern protective carrying technology with the traditional “explorer” look and feel. They are manufactured from environmentally friendly and sustainable materials such as hemp and cotton. Instead of plastic clips and fasteners, they used solid brass buckles with an antique finish. Form and function. 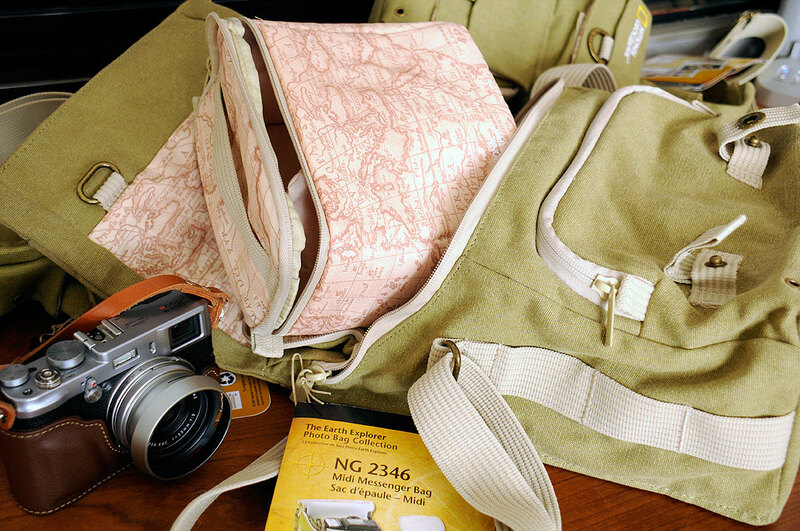 Each bag has its own unique features, but all have room for a camera, accessories, and personal gear. As much as we LOVE our JnK case, having to take it on and off to extract the memory card or the battery—something we do quite a bit—has proved to be a hassle. The one option we think JnK should offer for the X100 case is to add an opening to the bottom, like this half case from Horusbennu. The opening makes removing the memory card or the battery a quick and simple task. The Horusbennu half-case is made using synthetic materials (no leather, so vegetarian-approved). It does not have snaps which loop over camera strap, but attaches to the camera with a screw on tripod socket. It does not cover the slider on the left side nor the controls on the back. Great accessibility at the expense of less protection. 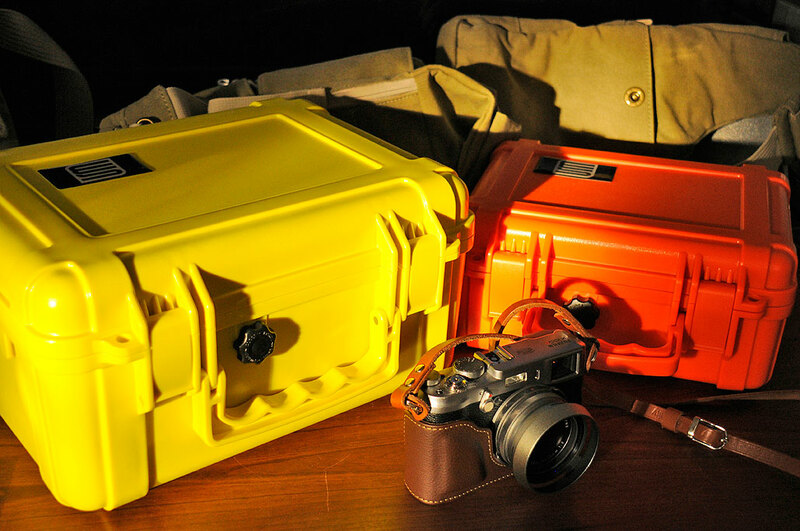 The JnK case looks a lot better with the X100S, but we think the Horusbennu is a more functional design. Occassionally, our adventures take us to places where our gear may require a bit more protection. For those outings, a rugged weatherproof enclosure can be the difference between the gear making it back in one piece or in many pieces. There are a few makers of hard-side waterproof cases out there (Pelican, Storm, Otterbox, SKB). We have looked at them all, except for the offerings from S3 Cases. They recently came across our radar and we thought this would be a good opportunity to take a closer look. S3 Cases got their start about ten years ago. They are headquartered in Colorado, make all of their products in the USA, and cater directly to OEM partners. Their water-tight cases have all of the same features as the more established players: pick-n-pluck foam, piano-hinges, double-latched closure, pressure-relief valve. What S3 Cases has that we don’t see from the larger players offer any more is color offerings. Marine Yellow, of course. Hunter Orange, definitely. And yes, they also have them in Basic Black. The case feels solid, well constructed, and the lid has a rubber gasket around the perimeter to seal out dust and moisture. 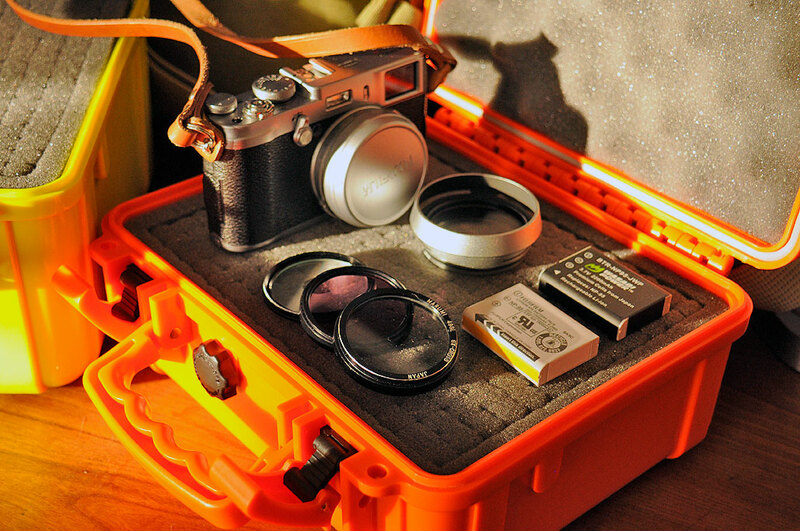 We are confident that, once sealed inside the S3 case, the X100S will be well protected from the elements. We hope this collection of accessories will help owners of the Fujifilm X100S get even more enjoyment out of this amazing camera. If there are items not mentioned that you think should be considered, drop us a note. We’ll take a look. And yes, we will have detailed FirstUse updates on all of these bags and cases later in the year.